WASHINGTON (AP) — Junk food for athletes? President Donald Trump’s offer of greasy burgers and fries to the college football champion Clemson Tigers brought a roasting from late-night TV hosts. Trump, a fast-food lover, said he paid for the meal himself because of the partial government shutdown, which has led to furloughs among federal workers, including at the White House. Otherwise, he joked, first lady Melania Trump and Karen Pence, Vice President Mike Pence’s wife, would be making salads. 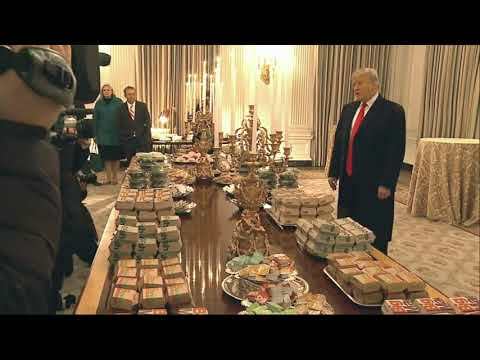 “Or do I go out ... do I go out and send out for about 1,000 hamburgers, Big Macs,” Trump said. Some Twitter users criticized the president for serving such food to college athletes, whose diets are strictly controlled by nutritionists. However, others tweeted they thought the menu was just right for college students. Trump appeared to defend his decision Tuesday in a tweet about how quickly the food was eaten. “Great being with the National Champion Clemson Tigers last night at the White House. Because of the Shutdown I served them massive amounts of Fast Food (I paid), over 1000 hamberders etc. Within one hour, it was all gone. Great guys and big eaters!” he wrote. Silver trays held stacks of wrapped burgers from Wendy’s. Also on offer were boxed burgers from McDonald’s, including Big Macs. White House cups bearing the presidential seal held the fries. Spokeswoman Sarah Huckabee Sanders said much of the staff in the White House residence has been furloughed because of the shutdown, “so the president is personally paying for the event to be catered with some of everyone’s favorite fast foods.” The White House didn’t provide the cost. Associated Press writer Shawn Marsh contributed to this report.